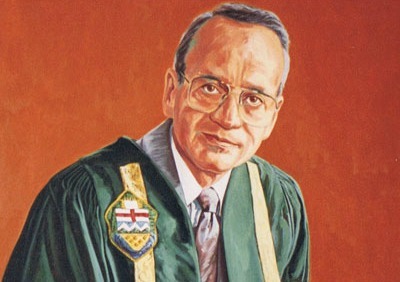 He was a master’s student in Education Administration (now Educational Policy Studies) who became chair of Elementary Education, the fourth dean of education (1972-75) and the University of Alberta’s vice-president before becoming the only member of the Faculty of Education to hold the campus’s highest office (1979-89). It’s fair to say Dr. Myer Horowitz has a uniquely intimate relationship with this institution. A tireless advocate for education and students throughout his tenure and into retirement, Horowitz reflects on the significance of the 75th anniversary of the Faculty of Education, the importance of leadership in education and the impact of his own mentors. Read the full interview with President-Emeritus Horowitz. As the first chair of the Department of Secondary Education and third (and longest-serving) Dean, Herbert “Pete” Coutts stewarded the growth of Canada’s first Faculty of Education in the early years. A fierce advocate for teacher education, Coutts was known as a leader in Canada and internationally. Under his tenure, both sections of the Education Centre were constructed and student numbers increased by over 500%. His legacy has been honoured with an Order of Canada, the naming of an award from the Canadian Society for the Study of Education and the Education library bears his name. Check out the interactive timeline on Coutts. ← Smash the colonial patriarchy. Restore the Indigenous Matriarchy.